Our puzzle escape adventures you can play now! With just your wits, clues from crates of artifacts and signs from the trapped doctor you must solve the mysteries and help free him from his certain grave. Your group will arrive and be met by the Curator of the Seattle Archaeological Antiquities division. Each team member is given a role which will aid you in your quest. The game is scaled to player amount. If you have less than 10 players and want an extra challenge just email us ahead of time for “Expert Mode”. 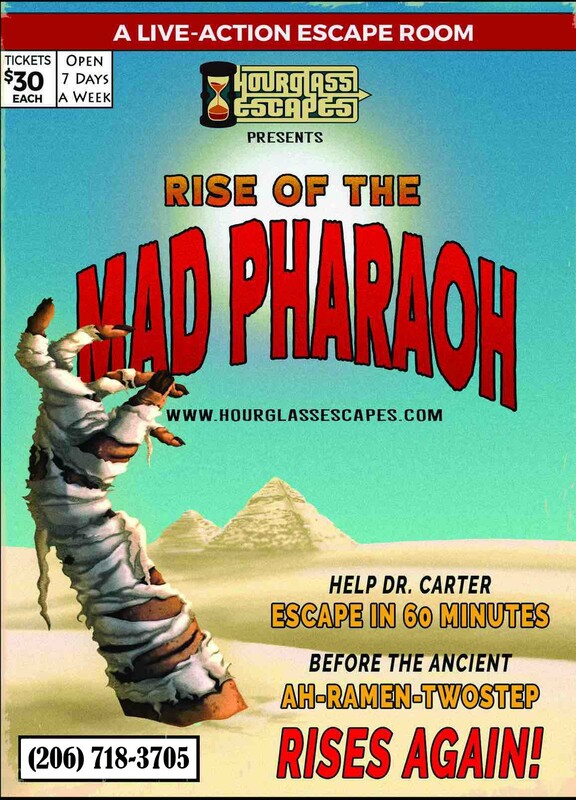 You have 60 minutes to save Dr. Carter! Hurry, time is running out! Ready for a brand new escape room game challenge? 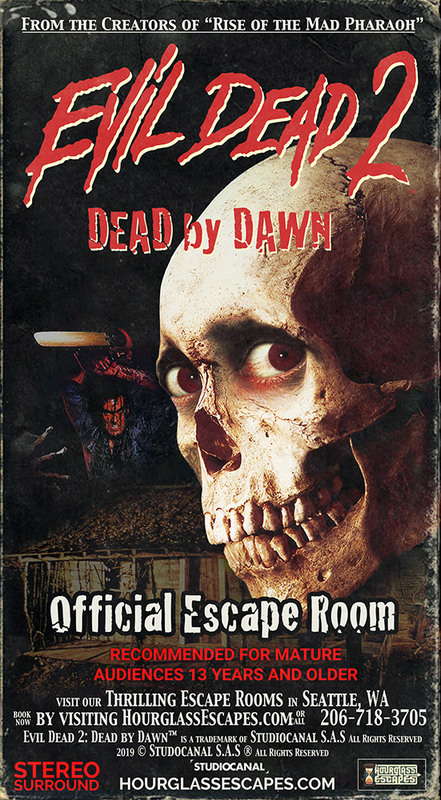 Our new Evil Dead 2™: Dead by Dawn™ official escape room is coming summer of 2019! Stay tuned! Come aboard the legendary ghost pirate ship of the Banshee Buccaneer! You start your adventure at Hourglass Escapes, where you will get tattooed, be fit for your pirate disguise and get sworn into the crew of famed oceanographer Jacques Cousteaudian, and then board the Ghostly Galleon itself. Then you have just 60 minutes to break the Buccaneer’s curse before you sink with the ship and become disembodied deckhands, doomed to swab the poop deck for all eternity! This is a fun and challenging experience for your office team building event, your event, party or at one of our restaurant partners. Ages 12 and up. All sales final- this is a live event. No refunds, reschedules or exchanges. Book us for your next Argosy Event! Subscribe to our email newsletter today and instantly receive a coupon for 10% off! We will never spam you or share your email address, and you can unsubscribe at any time. What are you waiting for?